How lucky have we been with hot sunny days this summer?!? I know it's maybe been a bit too hot at times, but for anyone spending time at a cottage or camping or poolside, the weather has been just delicious. Thank you summer! Speaking of summer - where did it go? How is it almost September already?!? Something about September always has me itching for a project . . . maybe it's all the back to school talk, maybe its the changing weather . . . or maybe I just love a project, haha. Which I totally do! Anyone who knows me knows I'm happiest when working away on a project - and boy do I have a secret project in the works right now! I am soooooo excited to share the news with you!!! But for today . . . let's take a look at what'cha been workin' on, shall we?? First up this week is this adorable side table in 'Chivalry' from our van Gogh Fossil paint line. This was Carries first restyling project and I think she did a great job! Carrie's happy with her results too because she's already started on her big dresser and bed frame to match! Thank for sharing Carrie! Check out this sweet side table she restyled using van Gogh Fossil paint in 'van Gogh' blue! Such a pretty colour! Great work on the distressing too Emily - thanks for sharing! Thanks for sharing Kathie! Keep up the awesome work! Ok, so how many of you have a nice adirondack chair or two that needs a little love? Looking for a project at the cottage this coming long weekend? 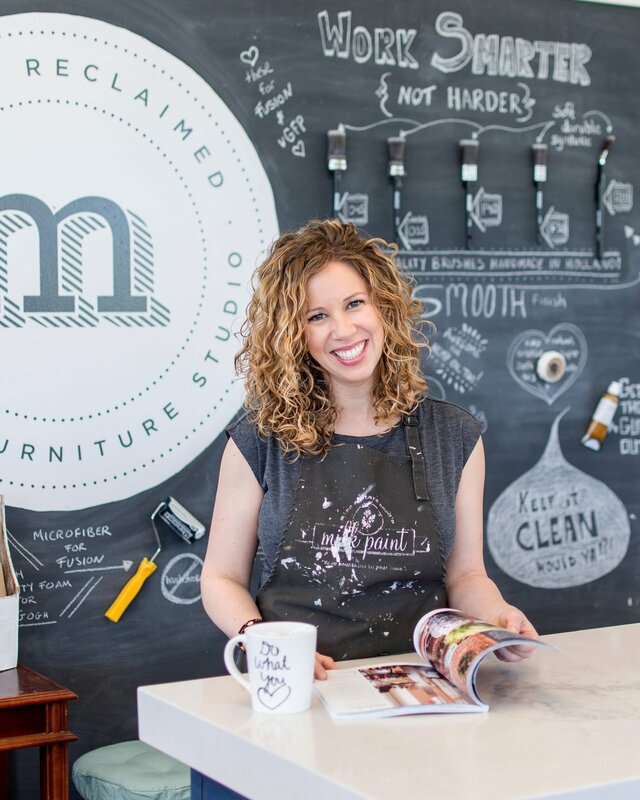 Take a look at how nice Toni's chair looks after some Miss Mustard Seed's Milk paint in 'Schloss'! Thank you for sharing Toni!